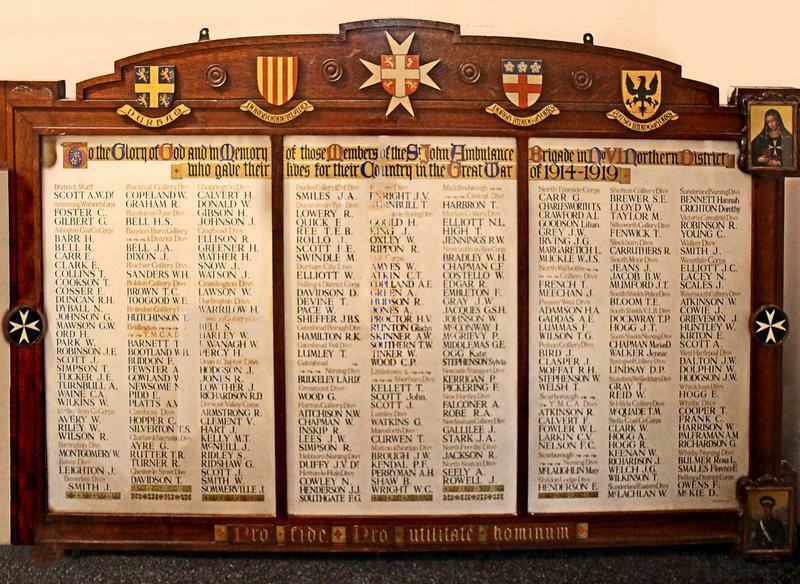 Glazed roll of honour set within ornate wooden frame. The frame separates the roll into three rectangular vertical sections. Frame is rectangular with a rounded extension. Lettering is painted in black and gold, with the title illuminated with red and blue. The St. John Ambulance insignia is depicted on either side of the frame, with northern district crests carved along the top of the frame. These include Durham, Northumberland, North Riding of Yorks and East Riding of Yorks. 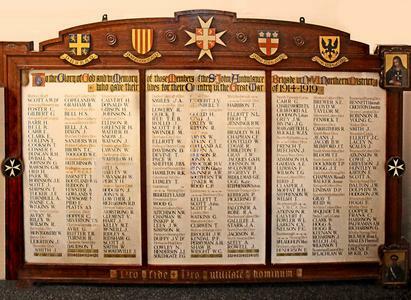 TO THE GLORY OF GOD AND IN MEMORY OF THOSE MEMBERS OF THE ST. JOHN AMBULANCE BRIGADE IN NO VI NORTHERN DISTRICT/ WHO GAVE THEIR LIVES BFOR THEIR COUNTRY IN THE GREAT WAR OF 1914-1919/ (Names)/ PRO FIDE PRO UTILITATE HOMINUM.